SER knows the effectiveness of a Managed Services solution is directly linked to the flexibility of the billing process. We have developed the ability to offer unprecedented product and billing flexibility to the Business Technology service provider. Using us as your Managed Services Finance Partner means you can now offer Finance as a Service (FaaS) on all things technology. Today, technology decisions are made based on software and services rather than hardware; as has traditionally been the case. Without flexibility in ‘billing capability’ linked to funding sources, it is almost impossible to offer as a service solutions that work for your customer. Effectively, this means that the finance industry has to adapt to provide Finance as a Service. There are two types of expenses that a Business Technology Service provider will bill their client for – these are what we call either ‘Above the Line’ or ‘Below the Line’ expenses. 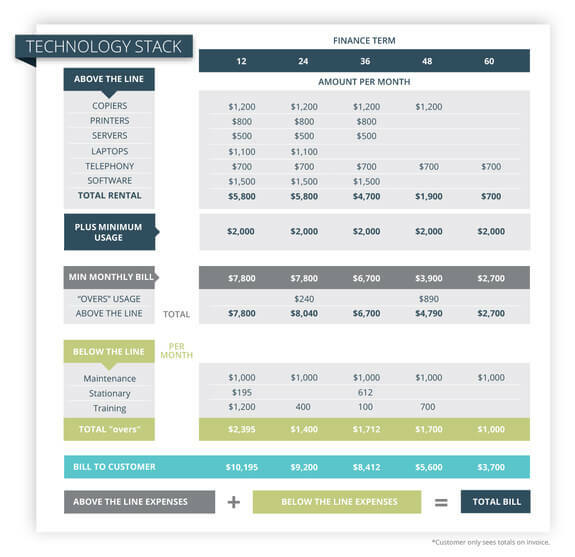 Any offer to your customer now involves the introduction of your Technology Stack, which includes both these expense types.